With the Twilight Protocol in effect, a group of unlikely allies are dispatched to Denver to discover if they can keep the Fourth Ring from joining with the Cackler. Instead they discover something waiting for them..."
While we are going to transcribe this into written fiction, the above Deadlands session event hosted by Saving Throw serves as the first Act of 3 entangled in our Twilight Protocol Series. This fiction takes place after the events of Wendy and Lucy in Tombstone (October 1881). The action will continue on Friday, May 3, at 2pm, as this posse continues their hunt to destroy the Fourth Ring. 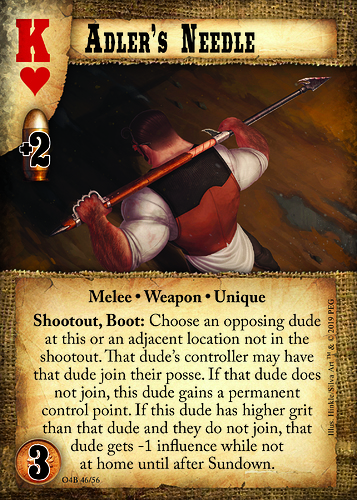 Speaking of their new leader, Mason Adler, today's spoiler is his weapon, being released in the upcoming expansion, "Out for Blood"
Hooray for Friday previews and a harpoon effect this is useful but not too horrible to be on the receiving end of.